Merry Christmas from the Golan Heights. On hundred and thirty members of this Galway-led unit will share the festive season together in Camp Ziouani on the Golan Heights, in close proximity to where the Christmas message began. They are on duty as part of the UNDOF Force Reserve Company - a unit that was deployed on peacekeeping duties in September until April 2017. The lead up to the festive season begins today. In a final ceremony in what has been a spectacular year for the Defence Forces, the troops of the 54 Infantry Group will be presented with their 1916 Commemorative Medal by the Defence Forces assistant chief of staff, Brig Gen Peter O Halloran, at a ceremony today in Camp Ziouani. Brig Gen O Halloran has travelled from Ireland for this ceremony and will be accompanied by the Irish Ambassador to Israel, Her Excellency Alison O Kelly. 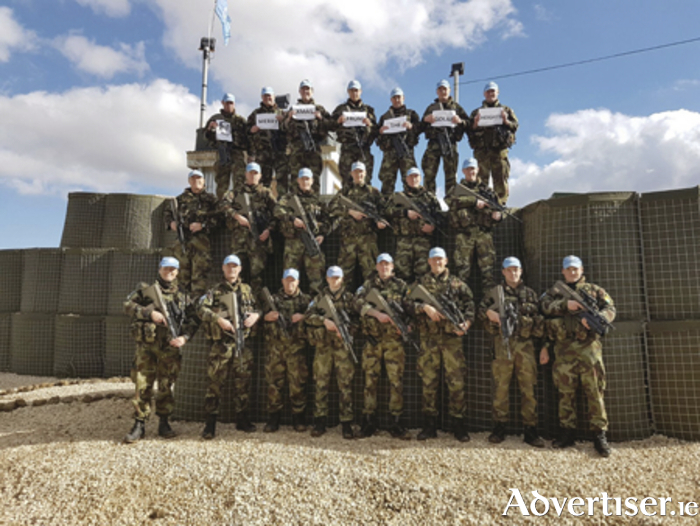 Many of these soldiers on this UN peacekeeping mission were part of State ceremonies earlier in the year at home, including the Easter Parade in Dublin and the State ceremony in Athenry on Easter Monday, as well as the highly successful ‘Flags to Schools’ initiative. Although far away from family and loved ones, this group of men and women will embrace the festive season despite their significant operational commitments. They will celebrate Christmas military-style. Christmas will begin with midnight Mass celebrated on Christmas Eve by the unit chaplain Fr Paul Murphy in the Camp Chapel, which was built by Polish soldiers. Each soldier will have a candle burning on the altar to symbolise his or her family or significant loved ones. Some of the troops have purchased traditional Christmas plants, poinsettias, which will be placed in front of the altar to commemorate loved ones who have passed away since the unit deployed in September. Unfortunately there have been quite a few. The programme for Christmas Day includes a fun run for charity early in the morning. Commanding Officer Lt Col Mary Carroll, the first woman to lead an Irish UN Mission, Sgt Major Fintan Lambe, and chaplain Fr Murphy will visit the troops on duty in UN Outpost 80 where she will present the soldiers on the outpost with their 1916 Commemorative Medal in a short but meaningful ceremony. Galway-based troops on this post for Christmas include Cpl David Cassidy, Cpl Barry Kinneen from Loughrea, and Pte Kenneth McCormack from Claregalway. GAA Hurling All Star 2016, Pte Patrick Bonner Maher, will also be with his platoon on UN Post 80 for Christmas. Later in the day, full traditional Christmas dinner will be prepared by chef Sgt Martin O Regan and his team, including Pte Joe Stanford from Gort, and will be served, as per military tradition, by the Commander to her troops. The fare will include Christmas pudding and Christmas cake prepared by culinary colleagues at home in Dun Uí Mhaoilíosa under the watchful eye of Sgt Kevin Fallon. But there will be no Christmas spirits – literally - as this is a dry mission and the soldiers are on 15 minutes ‘notice to move’ in the event of an emergency throughout the Christmas period. The only spirits in evidence will be the high spirits of this tight knit group of ‘brothers and sisters in arms’ as they share an occasion normally reserved for family and friends. Younger folks at home will be pleased to know that secret Santa will visit after dinner. Personnel serving with the 54th Infantry Group this Christmas include Sgt Major Fintan Lambe from Galway city, who is serving his 19th, and final trip overseas. While not his first Christmas away from home, he still misses his family at this time of year, although acknowledging modern communications have made things easier. "When we went to Lebanon first, we mightn’t even get to talk with our families on Christmas Day…now with Skype and WhatsApp it’s almost possible to be there which is important, especially important for young families," he says. There are many soldiers with young families, include Sgt Ian Joyce from Carraroe, who hopes to see his partner and young daughters early in the New Year when he returns home on leave. CQMS Phil Garvey from Headford is also a veteran of overseas Christmases’ past. Now on his 17th tour of duty overseas, he sees it as his duty to keep morale high for the troops. Cpl Alan Sheridan from Moyvilla will celebrate his first Christmas away from home, but appreciates this is a small sacrifice to make given the context in which the unit is deployed- "It will be different, but we intend to make the best of it," he says. Likewise Cpl Gerry Hynes from Maree, Oranmore, will spend his first Christmas away from his family, made more sad with the recent passing of his grandfather. Pte Eoin Forde from Coldwood is another who will be flying the maroon and white on the Golan Heights this Christmas. Commanding Officer of the 54th Infantry Group, Lt Col Mary Carroll, says she is hoping for an "uneventful day". "It is never easy to be away from home and family, especially at this time of year, but the resilience and resolve of our soldiers never ceases to amaze me," she says. "The more experienced troops will ensure the younger and less experienced members of the unit will be looked after – all will be busy. Hopefully the day will be uneventful from an operational perspective, but we’re ready to go if called in the event of an emergency. That’s the job we do so that everyone else can rest easy with their families and loved ones. We do our job in the service of peace so that the world may be a better place… at least for some people."